There’s not much that can rival homemade popcorn in its ability to act as a blank canvas, allowing you, the Bob Ross of snacking, to paint upon it your vision of deliciousness. Sweet, salty, savory, spicy—it all works. We reached out to chefs, staff, and food writer friends for their tried-and-true popcorn upgrades, and we look forward to reading your favorite toppings in the comments. I like to season my popcorn with a togarashi butter. It’s melted butter that is seasoned with togarashi, MSG and some sea salt. The togarashi gives it a little kick; the MSG gives it some umami-ness; and the sea salt helps to really bring out all of these flavors. Mexican corn-flavored popcorn, people! Cook the popcorn in light oil on high, then uncover and quickly add to a mixing bowl. While tossing, add melted butter, cayenne pepper, sea salt, lime zest and parmesan. Insanely good. Four words: chocolate popcorn, salted peanuts. Melt the chocolate with a bit of butter or shortening in the microwave. Meanwhile, pop the popcorn, then add it to a bowl with your favorite nuts. (I like to use honey-roasted peanuts.) Pour in the chocolate and mix it, letting it cool a bit so chocolate hardens. Caution, this is highly addictive. Coconut oil and Flavacol for movie theater flavor at home! My favorite popcorn topping is chocolate pudding, a combination I discovered purely by accident: a paper snack plate gone full tilt, sending its contents into and on top of each other. While other combinations were not as charming, popcorn and pudding paired together were a small miracle. A piece of warm, buttered popcorn in cool, chocolate pudding is the simple summer antidote to a $14 salted dark chocolate bar. The popcorn retains its crispness, its saltiness, all the while made sweeter without the nutty, saccharine nature of caramel. And you don’t even have to nearly spill a snack plate to make it yourself. Truffle butter popcorn: 1 gallon popped popcorn, 3 oz. melted butter, 1 oz. white truffle oil, 1 tsp. truffle salt, 1 tsp. pepper, 3/4 cup grated parmigiano reggiano. Mix the oil with the warm butter and evenly toss into the popcorn. Season with truffle salt, salt, pepper, cheese, and serve! My daughters love popcorn, and my wife always has a microwave bag around. At first, my oldest daughter Clara and I would melt butter, add salt then toss the bagged popcorn. That was a massive improvement. Next came butter, fresh cracked pepper, and parmesan, a sort of cacio e pepe version. It got mixed results from the girls, but us adults think it’s a very tasty. This is my wife’s foolproof method for making stovetop popcorn: Take a stainless steel pot (with a lid) and add a capful of vegetable oil into the cold pot. Have 1/3 cup of unpopped corn ready, and add three kernels in three different places of the pot. Now turn on the heat to medium-high. Wait until you hear three pops. Then quickly dump in the 1/3 cup of unpopped kernels, throw the lid on, and shake the pot continuously (use a towel to hold the handle!). Keep shaking until you hear no more pops. We grate in parmesan, and sprinkle in salt, MSG powder, and black pepper! Popcorn is my wife Tiffany’s favorite food, so I can’t mess with the format too much. 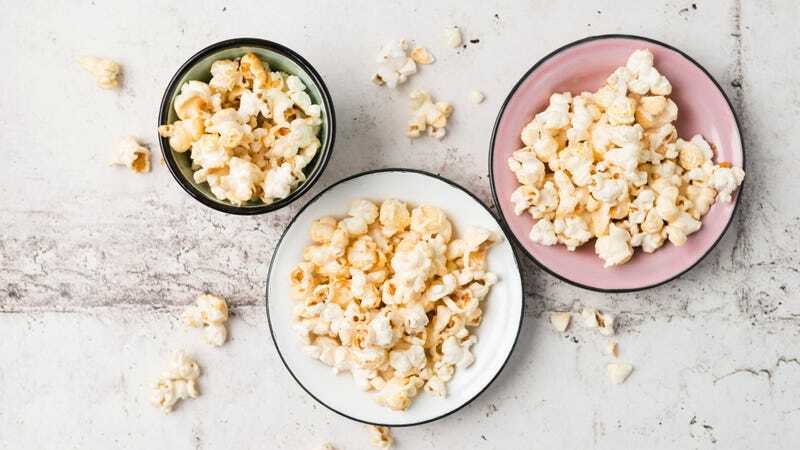 We can luxe out this super simple ingredient, though: Once popped, drizzle popcorn with melted butter, truffle oil and sea salt. Done. It has all the tenets of good movie theatre popcorn with some decadence. We did a take on Mexican street corn. We mixed kosher salt with Corona, lime juice and dehydrated it to have a beer-flavored salt. Then we steeped toasted corn husks into our clarified butter, then seasoned the hot popcorn with the butter, corn ash, Corona salt, cotjia cheese and chipotle powder. I’ve taken lobster roe and dried it, then blended into a powder and added other seasonings such as sugar, salt, and MSG to make lobster popcorn seasoning before. Really tasty! I have to give my friend Philippe all due credit for this combo: Peanut M&Ms inside a bag of microwave popcorn. When the popcorn is still hot in its bag, toss in Peanut M&Ms. The warm popcorn softens the chocolate inside, but the candy shell keeps it together. When you eat a handful, it’s melty-sweet-nutty-salty, but not messy. Goddamn brilliant.